Deforested area west of Steeple. This is the bud of the Birdsfoot Trefoil. I suppose the red pigment must become diluted as the yellow flower expands. This Common Spotted Orchid comes from the minimalist branch of the family. At first I thought it was a Butterfly Orchid from a distance. Knapweed - Centaurea nigra - has now opened, so yet another rich source of nectar. Two Rushes: Jointed Rush - Juncus articulatus - and Soft Rush - Juncus effusus. 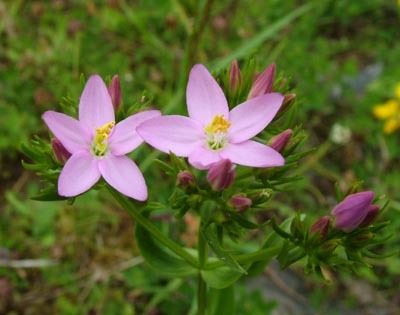 Common Centaury has now opened locally. A very interesting plant in that its stem structure is completely 2-dimensional: All of the flowers appear in virtually the same plane. Yellow Bartsia - Parentucellia viscosa - is extending its distribution range year on year. I'm now finding it in all environments from gardens to woodland to heath and waste areas. This Alder leaf was home to a caterpillar of some kind. Unfortunately, the inhabitant was gone. I'm including this shot of the underside of Common Catsear for comparison because the replacement species - Autumn Hawkbit - will be opening shortly.